The bane of Nerf Wars are big empty fields with no cover. They make for boring stand-offs and 90 foot charges that will wear you out really quickly. It took me a few weeks of tinkering and shopping around for parts to find the cheapest solution that's also fairly easy to setup. These are a great solution for open-field outdoor wars. About a year ago, I started thinking about creating obstacles for indoor Nerf Wars. A friend of mine had organized an indoor war in a school gymnasium, and needed obstacles to make the game interesting. 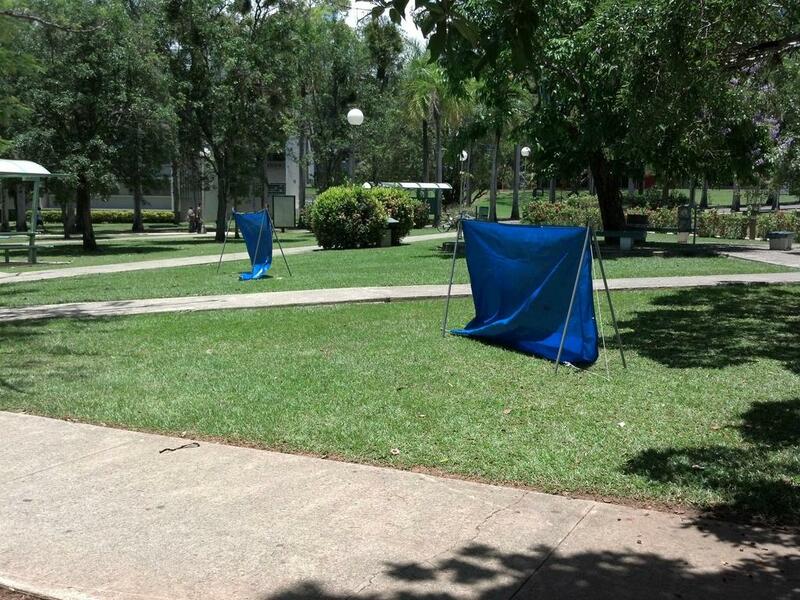 I have been trying a lot of different designs, all of them unsing tarps and PVC, and all of them standalone. I ulitmately made 10 of the above design, and used them at several indoor and outdoor war. They are functional, and helped a lot for the indoor wars, but are flimsy and unstable. I eventually broke them down into crude tepee shapes, with a tarp wrapped around them. This provided more stability, but greatly reduced the cross-sectional area; still not the solution I want. I highlighted that last one, because it is a hard requirement to fulfill. This is a frustrating project, because I really want to fullfill all the qualities I listed. On the subject of paintball, TechPB did a nice show about the history of various paintball gametypes. What I found facinating about this piece was his explanation of the evolution of various forms of cover, and how it affects the flow of the game. A lot of this applies to Nerf, and I took it to heart. These are the mobstacles I have been using at the Puerto Rican wars, and I figured I should share. They are very cheap to make, and so you can build a lot of them for a war. We play in an open grass field, so artificial obstacles have been vital. They have also held up well in windy weather (a common problem). Four 5 foot sections of PVC. I would recommend 3/4" or 1". These act as vertical support. Buy ten foot sections and cut them in half. Duct tape to bind the tops together. I suppose a more robust solution would be better, but duct tape has held up well for me. The setup should be fairly self-explanatory. 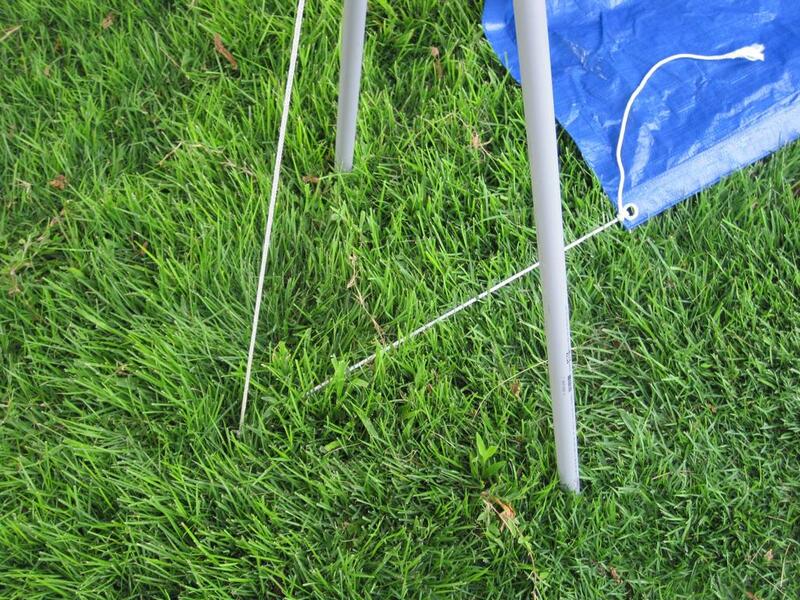 The PVC acts as a frame, with the legs angled slightly inward. 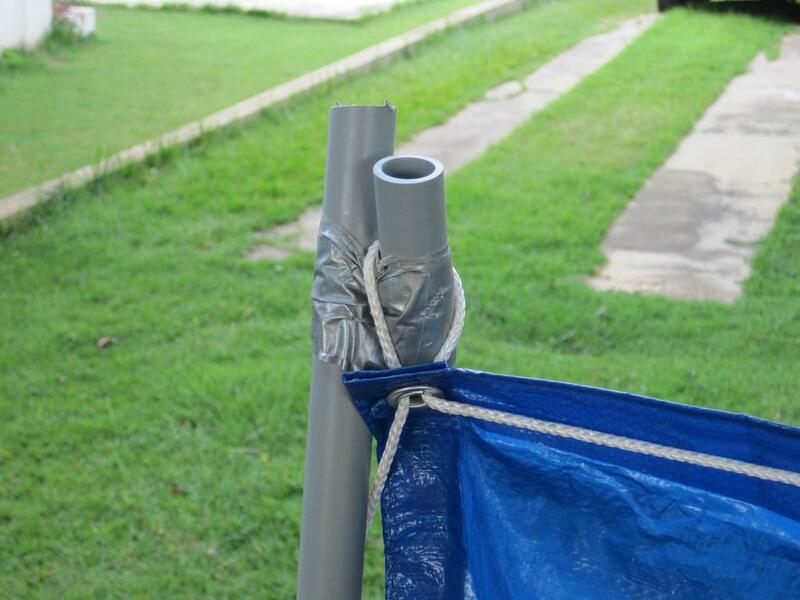 The rope his held taught by the stakes, and runs through the eyelets of the top edge of the tarp. I run the rope through the corner eyelets twice as shown. 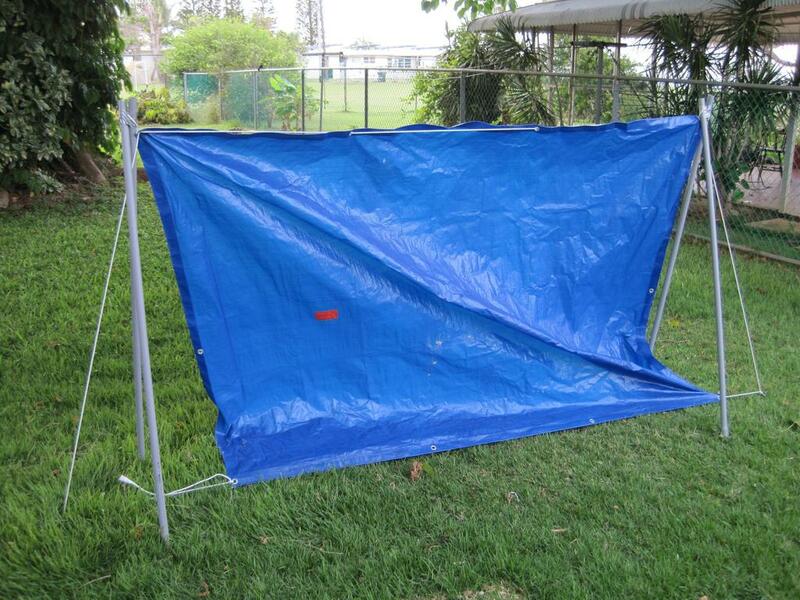 This holds the tarp tight against the frame, and keeps it from sliding away towards the middle. I used a rubber mallet to drive plastic camping stakes into each end. It is sort of hidden in the grass, but I tied the rope to the stake with a half-hitch knot. I then tied the lose end of rope to the eyelet at the bottom of the tarp, which keeps it from floping around in the wind.